As a big fan of Kayla Itsines and her Bikini Body Guides, I preordered her new book: The Bikini Body 28-Day Healthy Eating And Lifestyle Guide almost immediately after hearing about its release. Of course, I had no idea what to expect from the book and honestly almost forgot about it until 6 months later when I received the notification that it had been delivered. When the book arrived, I anxiously started flipping through the pages to see what they contained. I was pleasantly surprised to see that the first section was filled with educational information about nutrition, superfoods, and how to eat healthy when following a training program. I love that she included this section because she explains everything in simple terms and she answers many frequently asked questions that women have when it comes to healthy eating. Kayla also includes a section about how to prepare and cook certain foods. This was super helpful because I am not a great cook and often don't know the proper way to cut, cook, or store something. I love that she has a whole page about the different ways to cut vegetables. After the educational section, the next part is the explanation of Kayla's meal plans. The meal plans were designed to include the appropriate servings of the 6 major food groups (grains, dairy, veggies, fruits, lean meats, and healthy fats) spread out throughout the day. Each day of the meal plan contains 3 meals and 2 snacks. The best part about it, in my opinion, is that she makes it really easy to swap out a dish if you don't like or don't want to make it. Each day of the meal plan has an assigned letter, either A, B, C, or D. All of the letters have the same serving amounts from each of the 6 food groups, but the food groups are distributed differently throughout the day depending on the letter. For example, some of the letters have more servings of grains for breakfast and less for dinner. Other letters have the opposite or have an even distribution of grain servings throughout the day. The beauty of this system is that it if you want to swap out a meal, you just find another recipe that has the same letter assigned to it. This way you can ensure you are still eating the proper servings of each food group per day. The meal plan contains 4 weeks of recipes organized by day. 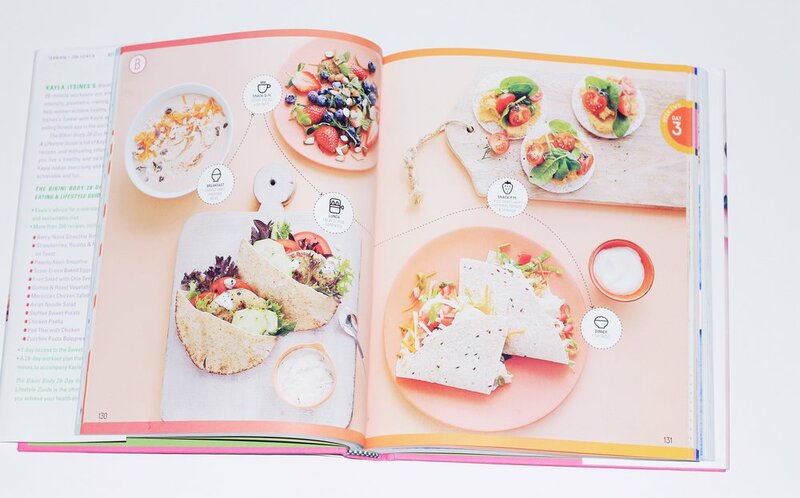 The first page shows pictures of all the foods you will be eating that day. I love that she did this because it gives you a good visual of what you will be eating and the food looks delicious. She really did a great job with the photography in this book, it looks stunning. When you flip the page, you'll see the recipes for all the meals for the day. She includes seven days of recipes for each of the 4 weeks and almost none of the meals are repeated. This is great because you definitely won't feel like you're eating the same things over and over. After all the meal plan pages, she includes a section of additional recipes that you can use if you want to swap out a meal. These are all organized by meal type and letter, making it easy to swap out. This section also includes some healthier dessert options, which all look delicious. As a somewhat picky eater, I was impressed at how good the recipes were. There wasn't a single meal that I made and didn't like. I also loved that there were several types of food I had never made for myself before, like falafel. Who knew that it was so easy to make? Some of my favorites from the week include the Super Green Baked eggs (Day 1), Quinoa and Roast Vegetable Salad (Day 1), Savory Crepe (Day 2), and Falafel Pita Sandwich (Day 3). For those who have followed Kayla for a while, you might be aware that many women complained about her original meal guide because it had low portion sizes. I was a bit skeptical before trying this plan, but I am happy to say that the portions were pretty good each day. There were a few days when I wasn't even hungry enough to eat the snack because the meals were so filling. It really does depend on the day, though, because there were a few that had less filling lunches, so I was a little hungry during those days. It is great that Kayla includes different meals each day so you don't get tired of eating the same things, but it takes a lot of time to cook that many meals. I was making these meals with my sister, but even with two people, we were pretty burnt out from cooking by the end of the week. For the last few days, we chose not to cook a few of the dinners because our family was already preparing a healthy meal and eating that was more convenient. The other downside was that we had to buy a lot of ingredients to make all 21 meals for the week. Some of the recipes take the same ingredients which made it a little easier, but there were still many things that I had to buy that I didn't already have. Going forward, I think I will choose 2 or 3 days of the meal plan and meal prep those for the week. This way I can still enjoy the properly portioned foods, but not have to cook so much during the week. For the most part, the recipes only contained a few ingredients and took between 5 and 30 minutes to make. There was nothing about them that was challenging, which is great for those who don't know how to cook well. I personally liked that the meals did not have a lot of spices in them since I have sensitivities to many of them. However, even I thought some of the recipes were a bit plain. Most of them only call for small amounts of salt and pepper and nothing else. For many of the recipes, I ended up adding a little hot sauce or more pepper to them to enhance the flavor. Each day of the meal plan contains some dairy and meat or fish, so I wouldn't necessarily recommend the book to someone who is vegetarian or vegan. Kayla does mention that you can substitute in dairy-free and meatless options, but there aren't many recipes that you can follow exactly without swapping something out. I don't eat much dairy and there were lots of recipes that contained dairy. I swapped the yogurt for dairy-free yogurt and tried to use less cheese on things that called for it. However, I did swap out a few breakfast and snacks because a lot of them contained yogurt. Overall, I think this is a great book and I am happy that I purchased it. At $28 ($20 now on Amazon, $15 for Kindle version) it is a bit expensive when you think about all the free stuff online, but the book is beautiful and contains a lot of helpful information and recipes. Like I said before, I think it's most practical to pick a few days out of the meal plans and meal prep those instead of following the guide exactly. I have been meal prepping recipes from it the last few weeks, and I haven't been tired of it yet! You can find the book on Amazon or Kayla's website.